Never miss out on discount promotions, special offers or new products again. 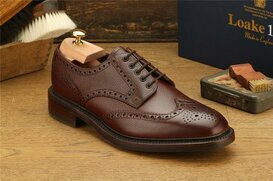 The high-quality men's shoes of the long established English shoe manufacturer LOAKE continue to enjoy great popularity worldwide. 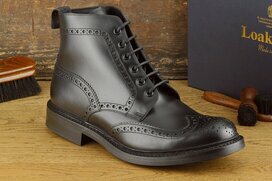 Loake Shoemakers have been a family-owned company for more than 130 years. 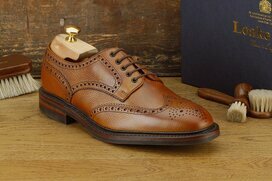 Now into its fifth generation Loake continue to manufacture finely crafted men's shoes at its headquarters in Kettering, Northampton. A coveted classic is the LOAKE Aldwych. Designed for the colder seasons, the classic stitched Oxford toe cap is fitted with a Goodyear welted studded Dainite rubber sole. Dainite is also a traditional British manufacturer with a long-standing history and reputation for high quality. 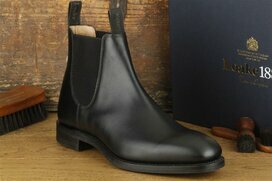 For close to 125 years it has been producing resistant, hard wearing insulated soles and heels made of rubber, which provide optimal protection against cold and wet weather yet which are elegantly cut. 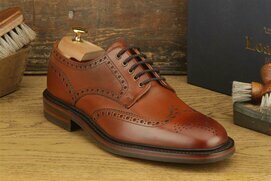 We also offer the LOAKE Aldwych as a so-called MTO model (Made To Order), which is manufactured exclusively for Langer & Messmer according to our specifications by the Loake Shoemakers. 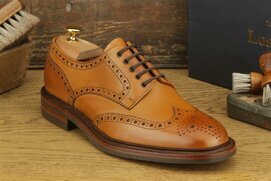 The LOAKE Wells is another MTO classic Oxford toe cap model which is suitable for those with a slighter wider foot (G fit). 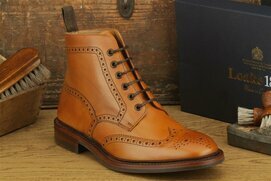 Anyone who likes to wear handmade shoes will sooner or later decide on a pair of Loake men's shoes. 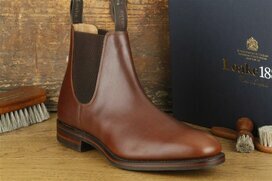 At Langer & Messmer you will find a wide offering especially for those colder, damper months: In addition to the Loake Aldwych we also offer in our online shop a range of boots with the tough-wearing and long-lasting Dainite and Victory rubber soles. 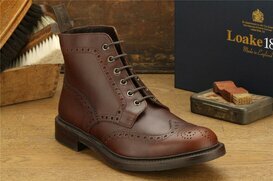 These include models such as the full brogue Dainite boot BURFORD with its characteristic stitching and punch holing detailing and its open 5-hole derby lacing; as well as the Apron fronted derby oxblood boot ANGLESEY made using the popular Capital Last with a Victory rubber sole. 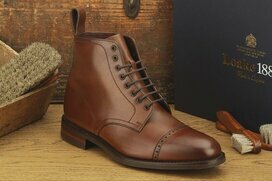 Important: Whichever model you decide on, keep in mind the right shoe care, so that you can enjoy your shoes for a long time! 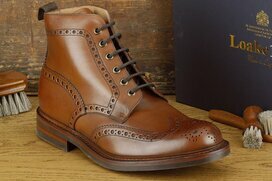 As a rule, you will always find men's shoes from Loake at reduced prices in our online shop. Take advantage of this great offer by browsing through our discontinued models section..